We are delighted to welcome you to our parish church, which has been a place of prayer and refuge for many centuries. Whether you are visiting or just reading about the church, please spare a thought for those who created this building that we enjoy today and pray for those who are maintaining it for others to appreciate in time to come. A story is told of the discovery on the steep hill “Mons Acutus” behind the church of a carved crucifix in black stone. This was around 1035 a.d. and became the prized relic at the newly founded Waltham Abbey in Essex. Its discovery began with a dream by the local sexton, so we know that there was a church here at that time. The present church began life in Norman Days as the chapel in the burial ground of the adjacent Cluniac priory. The magnificent priory gatehouse, Dovecote and fishpond can still be seen to the south of the church, also to the south, in the churchyard, is the 15c pulpit base, often mistaken for a font, and the remains of the old preaching cross that originally stood outside where the signpost is now sited. Both were moved in the grand 1869 restoration. The pulpit base, when first removed was converted into a birdbath for the vicarage garden! The original chapel was demolished, possibly by fire and replaced by a new church dedicated to St Catherine which in turn became the chancel of the present church when the nave and the north porch, with its parvise, or room above, were added in the 13th century. An ornate arch let into the north wall of the nave was the original decoration over the doorway into the 12th century church, which was replaced by the necessarily much larger present chancel arch. You may notice that the Chancel and nave are out of alignment. The chancel facing3 degrees to the south of east, points to the rising sun at Michaelmas, suggesting that the original church would have been dedicated to St. Michael, which ties in with the sacred hill very well. Many churches can be found with their chancels offset. Some notables are Thruxton in Hampshire, dedicated to Ss Peter & Paul and North Cheriton, Somerset, dedicated to St. John, which are both pointing to the north of east, while Toller Porcorum, in Dorset, dedicated to St Andrew, points to the south of east. The transepts were added in the 14th century and the tower in the 15th. The zealous Victorians demolished the church except for the porch and tower in 1869 and rebuilt it in the present style. Sadly they only preserved the nave windows, the square headed one in the south transept and the little one in the baptistery. Others are 19thc. The Victorians moved the organ from its previous site in the base of the tower and Geo. Osmond of Taunton installed it in its present position over the porch. The steps to the parvise, which originally were entered from the nave, were re-routed to come down into the baptistery, which had been formerly the Phelips family mortuary. This was opened up and the Phelips’ remains buried outside in the churchyard, but no one made a record of where. The 15th century font, similar in design to the redundant pulpit base, now occupies this space. You will notice the corbels supporting the organ gallery are of minstrels. The crude one at the eastern end was unearthed in the churchyard during the restoration, which sparked the idea for the others, which are copies of some to be seen in the Victoria & Albert Museum in London. The ringing chamber floor, which had previously been sited above the nave arch in the tower was removed to release the view of the whole of the west window and the ringers, clock and bells placed higher in the tower. You can see where the doorway was filled in. Coloured glass was installed in the windows of the tower, nave and transepts, which was removed in the 1990’s and replaced with clear glass. Stained glass figures were displayed in all the chancel windows, and a new pulpit, lectern and bible were provided. New pitch pine pews were obtained to provide maximum capacity and a coal fired underfloor heating system installed. The whole project took more than a year and cost £3,200 involving 76 men who were entertained to a dinner at the King’s Arms following the re-dedication service. In more recent times the children’s pews were removed from the base of the tower to form a choir vestry and the old choir stalls situated in the crossing were removed to facilitate the re-siting of the pulpit and to create space for a nave altar. The north transept hosts the memorials to the Phelips family of Montacute House and the south transept the Phelips family pews, behind which sat their servants who gained entrance through the south door. Formerly this was a side chapel and in the eastern wall is a piscina for washing the priest’s hands and the communion vessels at mass. On the central mullion of the east window is a carved bracket which once held a crucifix or statue above an altar and to the left, the hagioscope, or squint, which enabled the priest in the south transept to see the “sacring” at the high altar; the elevation of the Host at the parish Mass. This was the sacred moment for mediaeval congregations. Masses would often take place at various altars in the same church at the same time. Pictures and plaques in the chancel remind one of our links with Montacute, Nr Hobart in Tasmania and Waltham Abbey in Essex, with whose ringers our bell ringers have formed a strong bond and meet regularly. The commandments either side of the reredos came from the old priory as did our original 5 bells which were bought by the parish at the reformation. They were cast by Thomas Hey who had his foundry in the village at Smith’s row. Some of his bells still remain, one at Wraxhall near Cattistock in Dorset, another, recast by Taylors, at West Chinnock and one at Pitney near Somerton, The latter two bear the inscription “Sancte Katerina de Monte Acuto”. After Thomas Hey came the Wiseman family who were casting bells in the village from about 1585 to the mid 1600’s. Their foundry was on the western side of Bishopston, approximately opposite the Working Men’s Club. In the last century a large quantity of black moulding sand was unearthed in the garden of the local chimney sweep, who it is said, mixed it with soot and sold it to the locals to put on their gardens. It is also rumoured that he followed the seam under the next door garden which eventually collapsed, which lead to an embarrassing neighbourly confrontation! Details of the bells are as follows:- No.1 is modern, cast in 1901 by Mears & Stainbank, London; No.2 cast by Wiseman. “First I call to wake you all Anno Domini 1619 T.E.G.C.” No.3 cast by Wiseman “Geeve thankes to God Anno Domini 1610.” No. 4 cast by Wiseman “Hee that heareth mee to sound let him alwaies praise the Lord 1614.” No. 5 Recast in 1810 by Thomas Mears of London Probably originally a Wiseman bell. No. 6 “Anno Domini 1733 William Knight bellfounder” of Closworth. The ring is in the key of “D” and the Tenor weighs 24cwt approx. (1.2 tonnes) The Treble is in memory of Queen Victoria and the 6 bells were hung in 1901 in an oak frame by Harry Stokes of Woodbury, Devon and re-hung again in 1948 on roller bearings in the same frame, by Mears & Stainbank of Whitechapel, London. 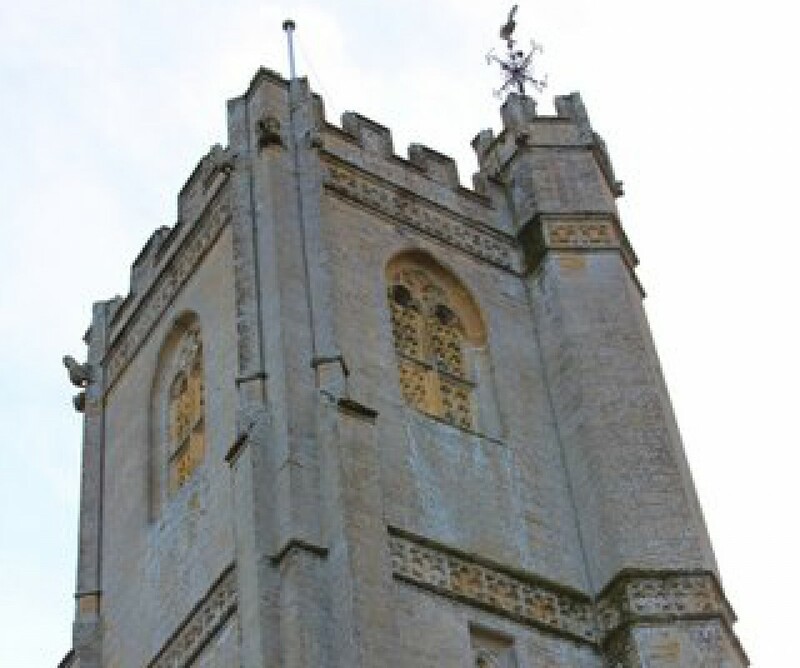 The Clock which strikes the hours on the Tenor bell possibly came from the Priory at the same time as the bells. It had no face until 1815 when John Baker, the local blacksmith, made and installed the mechanism. It was restored in 1974 by one Humphrey Hamlin, a Montacute man living in the same house as John Baker. The clock is still in use and was wound daily until Humphrey Hamlin and Gordon Rendell fitted winding gear in 2009. Chimes controlled by the swell pedal. dating from about the same time. For security reasons these are all kept elsewhere. Outside the church is the opportunity to see, particularly in sunlight, the rich honey colour of the local Ham stone (quarried in the hill above the village) used in building the priory, the Church, Montacute House and most of the older buildings in the surrounding villages. St.Catherine’s tower is not as decorative as some of the other 15th century churches in the area. It almost certainly had pinnacles as finials to its flat topped buttresses which probably suffered damage in the great hurricane that swept across Europe in 1703 and were never replaced. The bell chamber is lighted on each face by finely pierced louvres of Ham stone. On the south side of the tower the lower bands of quatrefoils have been planed off. This was done by the sons of Revd William Langdon, vicar from 1790 – 1828 so that they could play “fives” between the buttresses. Fives is a ball game rather like squash but played with a gloved hand instead of a racquet. Several villages around have specially built “Fives Walls,” usually in the precincts of the local inn. Headstones:- At the top of the churchyard are three interesting head stones all in rhyme, one to a huntsman in the employ of the Phelips family, another to a nurse and a third to a doctor. A huntsman long to be. But liked his can to see. The foremost of the chase. When death put an end to the score. At one place with conduct approved. Who ne’er valued the wind or the weather.